Many devotees cherish nothing more than being with Amma when She sings bhajans. Some sit with their eyes-closed in deep meditation, some sing along— maybe reading the lyrics from bhajan books—and others simply sit, witnessing Amma as She gives Herself so fully to the music. 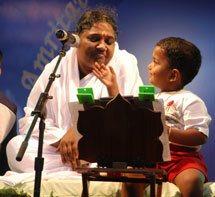 During Amritavarsham50, Amma came to sing bhajans six times. She sang old favourites such as “Sri Krishna Sharanam Mama” and “Nilambuja Nayane” and new ones too, such as versions of “Iswar Tumhi Daya Karo” and “Anantamami” in a dozen different languages, including French, Israeli, Italian, English and German. Amma also sang songs in almost all the different Indian languages! It was definitely a delightful surprise for all of Amma’s children from around the world to have the pleasure of hearing Her sing to them in the mother tongues. One night as I was gazing up at Amma’s beautiful face as She was singing, I happened to turn around, and what I saw took my breath away: a stadium full of faces, of all colours, a mass of orange and white, silk and cotton, men and women, children and adults—all singing with Amma. All voices raised up to the divine. Unity in diversity. It was a sight I will never forget. I felt honoured and grateful to be there—to be a part of that precious quilt of humanity that Amma had sewn together with such love and care. As I watched and listened, I understood something that I had never realised before: Amma is always the same—no matter where She may be. There could have been 50 people there rather then 150,000 and She would have done nothing different. She would have simply sung Her heart out, as She always does, tapping Her drumstick on Her peetham and moving Her hands to the rhythm of the sacred sound, raising Her arms to the sky and calling out God’s name. Cameras were everywhere you looked: big revolving cameras, small digital ones, on the stage and in the audience. Yet, our Mother was the same—a constant flow of divine love.